While many believe smaller is better, studies are mixed on exactly how much it can improve academic outcomes, considering the cost. There’s no universal standard for the best class size, though some states and school districts have instituted policies, particularly in lower grades. While many believe smaller is better, studies are mixed on exactly how much it can improve academic outcomes, considering the cost. The ratio of students to teachers is at the heart of a teacher strike in the nation’s second-largest school district, where tens of thousands of Los Angeles educators walked out Monday. Teachers have complained about having kids sitting on window sills or the floor of overcrowded classrooms that can push past 45 students. He said there’s no easy way to assess the impact of class size on educational outcomes over the last couple of decades in the Los Angeles Unified School District — in part because classes have been overcrowded despite a state mandate calling for an average class size of 30 students through eighth grade. “When your class size can be increased dramatically, you lose the ability to ensure that you can do right by the students you are serving,” Rogers said. 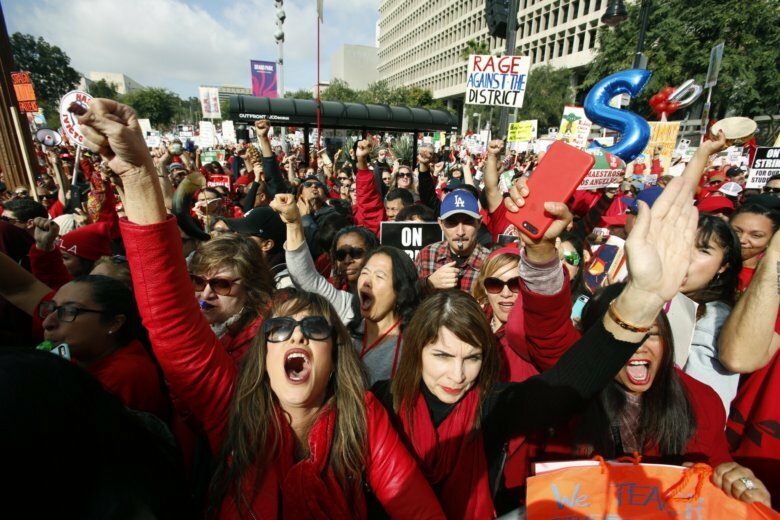 United Teachers Los Angeles is demanding the elimination of a longstanding contract clause giving the district authority over class sizes. If the district won’t agree to remove the provision, union leaders say they can’t trust that school officials won’t ignore any deal it cuts on class sizes in the future. Superintendent Austin Beutner has said he would like to reduce class sizes even more but the district simply doesn’t have the money. He has suggested the union might consider trading other contract demands for greater reductions in class size. Brent Smiley, a 23-year district veteran who teaches at Sherman Oaks Center For Enriched Studies, said he’s had as many as 42 students in one class and that his smallest has 39. “Struggling to keep them focused can be an impossible task,” he said this week. “The bigger the class, the more likely you are to treat kids as a big group, and you don’t read papers as good, you don’t read them as closely, you don’t have as much attention to give to each child,” Mathis said of teacher quality. But Matthew Chingos, vice president of the Urban Institute’s Center on Education Data and Policy, is skeptical of a one-size-fits-all approach. He’s studied state-regulated class sizes and says that it may not be the “biggest bang for the buck” for every classroom. That experiment, Chingos said, didn’t prove its worth because there was no prior data for comparison. Without more high-quality research, Chingos said parents and teachers both push for smaller class sizes based largely on their intuition that it’s better for children. Teachers also benefit, including adding to the union ranks, he said. “Class sizes are a political winner. No one thinks it’s bad. If money grew on trees, then sure,” Chingos said.